J-Flex: Your complete source for FKM sheets including FDA Compliant Blue & Off-White FKM. This material is manufactured in an easily identifiable blue colour which is of course synonymous with food processing industries. The blue colour, of course, makes identifying any contamination clearly identifiable, so even if a small particle gets into the food during the production process, you’ll know quickly. Blue FKM Sheet and ‘O’ Ring Cords now available in the standard food industry colour making in so much easier to identify contamination. Comfortably handles hot, oily and greasy food products. Suitable for repeated food contact. Non-marking and does not taint food. Resistant to chlorinated hydrocarbons; fuel and acids. Complies with Reach – SVHC listed ingredients. Popular for gaskets; seals; strips and joints for food; beverage and pharmaceutical. If you are looking for more information or want to enquire about our FDA approved products then fill out the contact form on the right and we will get back to you as soon as possible. Alternatively you can call us using our number at the top of the page or request a quote, sample or a callback using the buttons below. 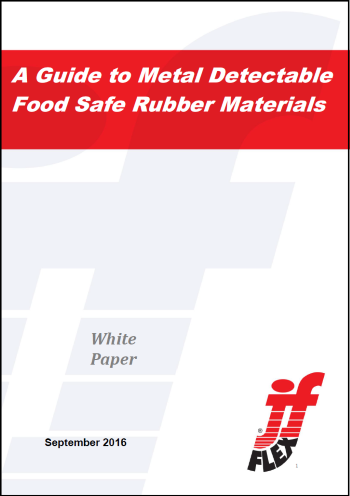 J-Flex presents ‘A Guide to Metal Detectable Food Safe Rubber Materials’ White Paper.